Essence's Model Rocketry Reviews is pleased to announce a new photo contest. 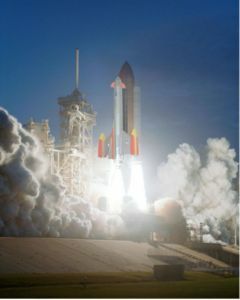 Get out your best Fantasy Rockets and get some pictures to make us all envy having it and submit them today. Entries will be judged by EMRR Guests during a voting week of June 2 - 9. Entry must be (1) to (3) photos showing DIFFERENT angles of same rocket. Entry may be GIF, JPEG, of BMP - or - if you don't have an electronic photo, e-mail us for a mailing address and we will scan the pictures for you. The "write-up" need only be basic information of what "inspired" the rocket. 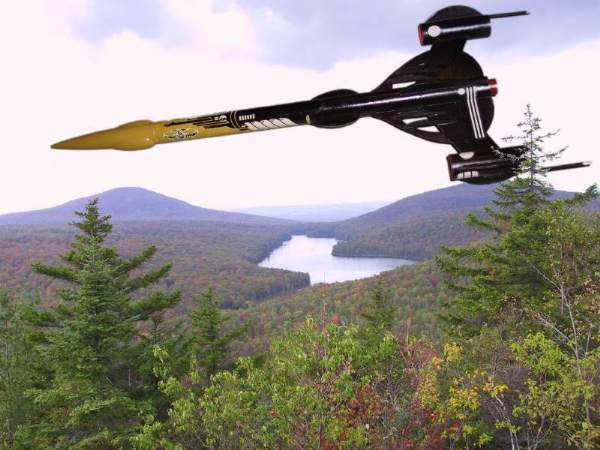 I would be nice to know what it flies on, altitude, recovery and success (or not) information too! Contest is over on 6/1/2002. Online Voting will take place from 6/2 - 6/9. A copy of the new Spaceship Handbook by Jack Hagerty and Jon C. Rogers, published by ARA Press. Over 100 Data Sheets on 75 different spacecraft. 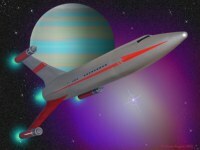 An EMRR Guest: Casey Smith An Estes Mercury Redstone kit has been contributed for this fantasy contest. 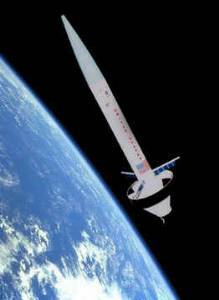 One of my favorite rockets is the Lunar Express from Public Missiles Ltd.. 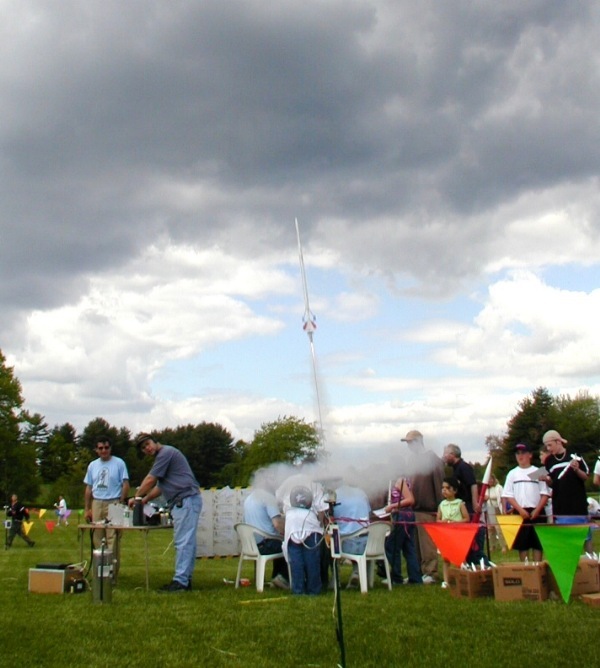 This 6.0" diameter rocket stands 52" high and weighs in at around 12 lbs. I've flown it on an I195J and I435T. The I195J provided a majestic flight to about 900' for my level 1 cert., nice launch but a bit under powered. The I435T motor on the other hand ripped off the pad to about 1500'. 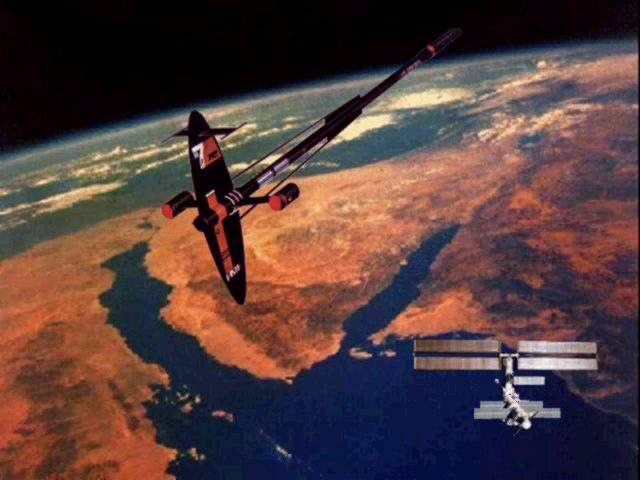 The Lunar Express was the last to launch that day due to a fast moving thunder storm headed toward the launch site. 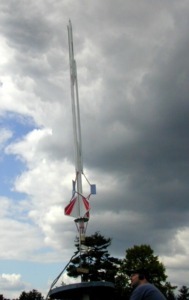 The 6' drogue parachute with spill hole ejected right at apogee. I had set the altimeter to deploy a 13' main at 400' due to the winds picking up. This is one rocket you like to have land very lightly due to the pods on the end of the fins, this parachute combination worked well on the I195J launch but one pod still broke off. Unfortunately the main deployed at what looked to be about 800' which coincided with the arrival of the storm front. I could swear the rocket started to go back up when the main deployed. I watch in horror as the storm carried my precious rocket away. Then reality hit me, I was standing in the middle of a corn field and all hell was starting to brake loose in the clouds above me. By the time I got back to the car I looked like I had just gotten out of a swimming pool. My sincere thanks to the person the put my two boys and rockets in my car before the rain hit. I made several trips back to the launch site in an attempt to locate the Lunar Express. As I wondered through the woods with my very patient wife I meet a person riding their horse and asked her if she knew of the rocket. To my surprise she told me she saw a large parachute blow over the ridge line the day of the storm and that it came down about 2 miles from where I was. To keep a long story short I never did find the rocket but after 16 months managed to find one for sale on the internet, which is what you see here. I touched up the filets, sanded off the old paint, modified the fins and repainted it with using Rustoleum's Metallic Silver. I hope to launch this Lunar Express sometime this summer. I was 3 seconds away from calling off the launch due to the deteriorating conditions, learned my lesson the hard way instead. It will not happen again! 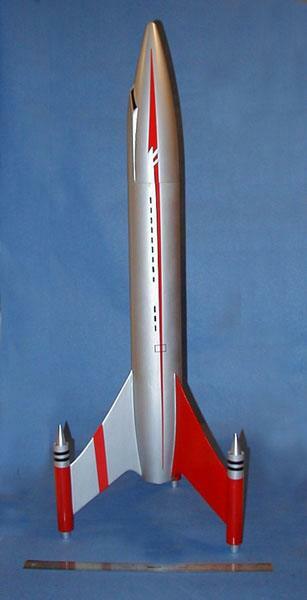 Brief: This is a fantasy-scale model of the Fireball XL5 spacecraft, which was the subject of an old TV show. 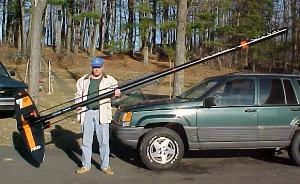 I have seen a photo of a high power Fireball model, however, my motivation came from a thread in the Rocketry Forum. Inspired by a model being developed by Steve Rogers, I began thinking about the pile of parts that I got from LOC as my Descon 9 prize and decided to give it a shot. I made several minor adjustments to the scale factor to fit the parts I had on hand, but the overall look is correct. Mission status: Her maiden voyage was successful! See the full review here. 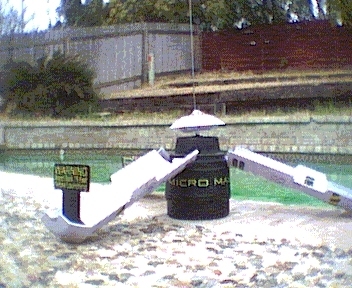 Brief: I built my first Andromeda in 1975, when I was 10 years old. The price was a whopping $4.95, a months worth of allowance. I remember finding recyclable bottles and turning them in for 2 cents each and saving my allowance. I was the envy of the neighborhood. I think I got two flights out of her, when the chute failed to deploy and she lawn darted. I remember building at least three or four more of them in the years to come. 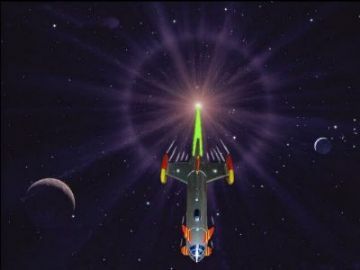 I had several rockets, but the Andromeda was always my favorite. Most of the time she was the only rocket I would even take with me to launch. I think it was the slow, "majestic" lift-offs and the fantasy of pretending I was the captain, traveling to Jupiter. I knew all of the fantasy details described in the instruction sheet. 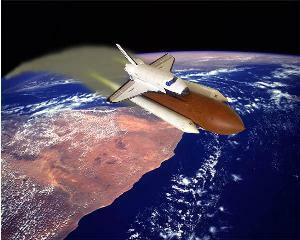 "The 30 man exploration vehicle was built in earths orbit. She is over 2000 feet long and the sails are 600 feet wide. 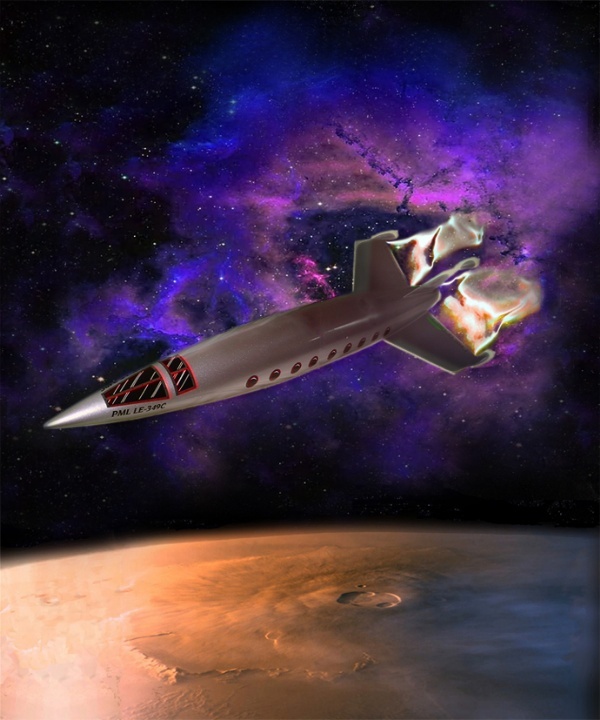 Propulsion is a center hybrid rocket engine and two outboard nuclear ram-type engines." Boy, to be a kid again... Thanks Vern Estes. 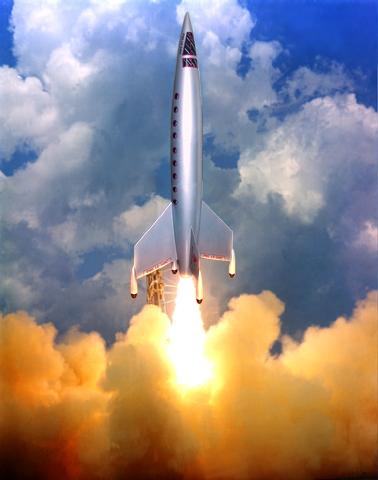 My father would pick me up on Sundays and, during the summer, we would sometimes build and launch rockets. The Andromeda was his favorite too. He passed away when I was 15, in 1981, and that summer we built and flew our last Andromeda together. 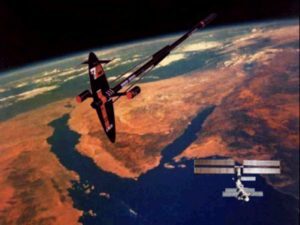 I didn't launch rockets again until I was 22. Well, I sent the Andromeda up on a J350. It left the pad with authority and flew perfect. It arched over at apogee and the deployment came out perfectly timed. Wait... What's this? The chute is tangled! The darn thing backward slid all the way in at a pretty good clip. (That's what 16 pound rockets do ya know.) It hit the ground with a thud. Not pretty. 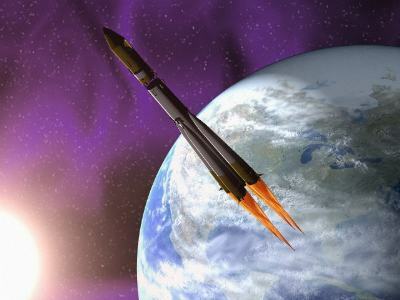 With my heart stopped, and my stomach in my throat, I told my self "its only a rocket, right?" I am in the process of rebuilding it right now and should have it ready to fly again at the May 11 NEPRA launch. This time on a J570. 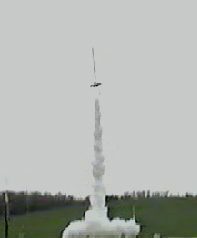 A video of the launch can be seen on my website. 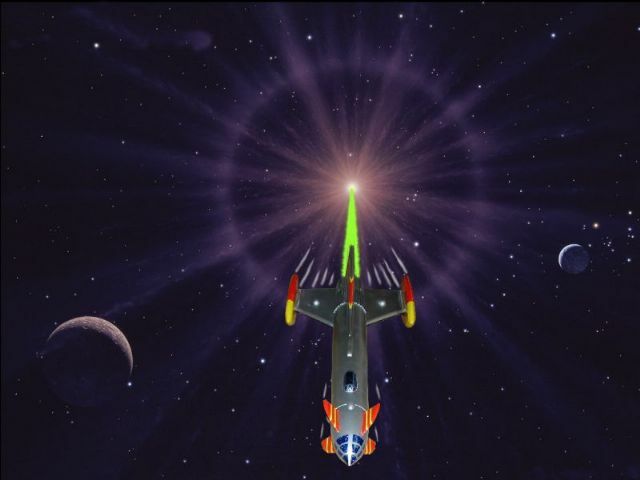 The Quasar was among my favorite rockets in terms of style. Its simple and elegant 50's style is quite appealing. I also like the "jet" look of the pods. The jet cones and tails in the original kit were my first encounter with vaccuform. The original Quasar had an ejection baffle - mine met its end through the shock cord coming out of the main body. 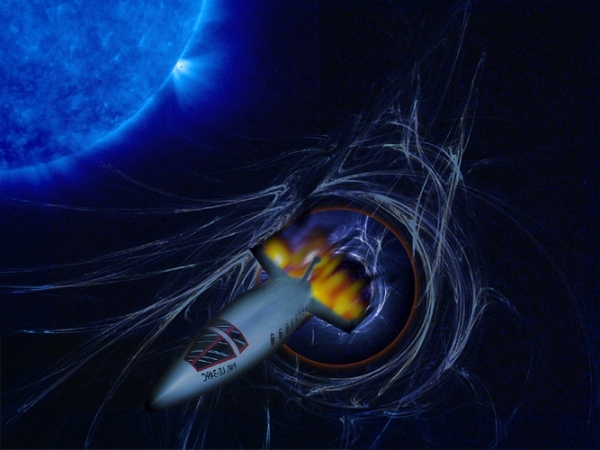 I went nuts with photoshop and created some space scenes using images of the Quasar along with computed generated "space stuff". The images are 1024x768, in case you wanted to use it for wallpaper. 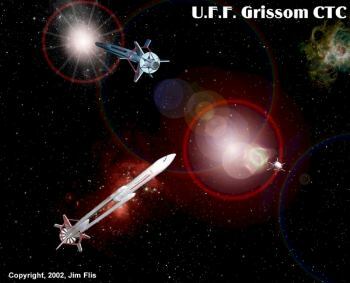 The UFF Grissom stands 30" tall and uses 13mm motors (A3-2T, A10-3T). 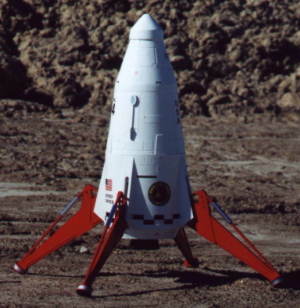 Using ducted ejection for parachute ejection, this model was made possible with the introduction of Apogee Components PT6 tubing, many years ago. The nose cones for the PT6 tubing are all custom made. The decals were made and printed using Corel Draw and an ink jet printer. 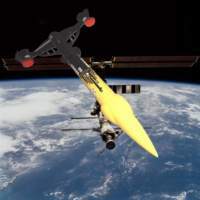 The model flies beautifully on either motor with parachute ejection right at apogee, sometimes with no tilting of the model, coming to a vertical stop just before deployment. The solar panels can be problematical, but I've worked out a secure method of attaching them and have seen no damage in the last 5 flights. 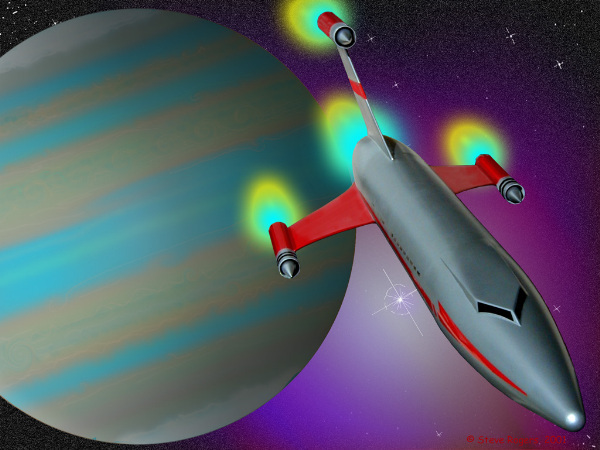 The model is loosely based on other models, but was truly inspired by 2001 A Space Odyssey with the idea of inter-planetary luxury space transportation. The UFF Grissom CTC has all of the luxuries that one would expect of a Jupiter Class Luxury Liner including casinos, movie theaters, live theaters as well as a number of areas devoted to Low-G activities (soccer, swimming, air-bikes) and Zero-G activities (G-Tag, horse shoes, acrobatics, etc.). Its primary route is the Mars-Jupiter run, but the UFF Grissom is being outfitted for the first inter-stellar voyage with a crew of 325. 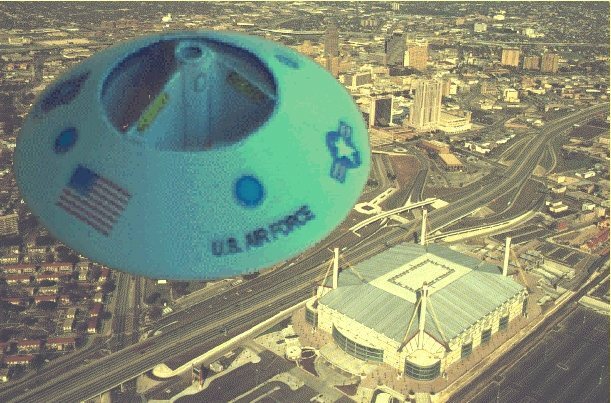 Back in Sept. 99 down in Austin was the Rockamole competition flights where in the state of Texas the event Future/Fiction was held for the first time. Didn't have an entry abut a couple of months prior until a co-member of DARS gave me a print out and web site to look up info on the A9 Transatlantic Ballistic Missile. Found diagrams and flight profiles showing that it was a second stage for a piloted V2 with wings that the German Empire was going to build and launch at the US during WW II. Using the diagrams and already started to build a 1/40th scale V2 according to Peter Always' book 'Scale Bashing' I proceeded to scratch out the A9. Nose cone and boat tail are ESTES PNC-60s, the main fuselage is a section of ESTES BT-60, the wings are Evergreen styrene plastic and the two fins are 1/16" basswood. The cockpit is a 1/2" wooden dowel turned in a drill press to the shape of a tear drop then split in half. Camouflage gray stripe paint job is free hand air-brushed where decals are from Microscale Decals for an ME109 and Tiger tank. About 3 oz of modeling clay in the nose. At the competition had it placed on the pad some photos taken then when I applied the alligator clips could hear a continuity signal. Started to get up off my knees when "Whoosh!" it took off. At first only had about an oz and a half of nose weight so it had a very unstable flight, figure eights and all just a few feet above our heads. It landed on one of those blue plastic canopies when the ejection charge went off burning a 2 inch hole. Fortunately no damage to the rocket. The judges and all were not ready, the LCO had a problem with the box so they let me try again. Being I had to add another 1 1/2 ounces I went from an ESTES C6 to a C5. This time straight up with a bit of a roll, chute opened just fine giving me first place in the event. Years later an author of documentary books spotted a picture of it in V2rocket.com and after getting my permission will print it in his next book covering long range bombers and missile concepts to be used against the US during WW II. The black and white shot is my suggestion of how the editors could show it since it had to be in black and white. The color shot is the original before doctoring. 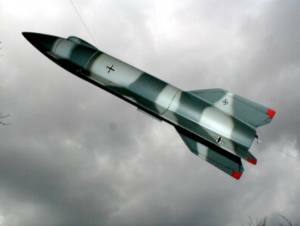 My son gave me this rocket as Christmas Present, and though didn't much care for the design, I sought to finish in a way that I though was "realistic looking" if that were possible. I examined pictures of several launch vehicles and settled on this paint scheme, for which I made custom decals. 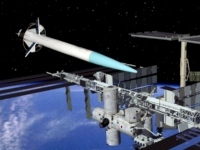 Here the Satellite Drone pulls away from the International Space Station after accepting a cargo to be carried to a higher orbit. This digitized scene includes a photograph of my favorite rocket, the Jules Verne 29, a Retro Rocket Works kit that my husband gave me for my birthday two years ago; it also happens to be named after one of my favorite authors, so I placed my rocket in a fantasy scene that celebrates Jules Verne. 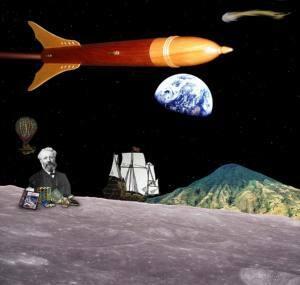 Novels represented: From the Earth to the Moon (The famous 1968 Apollo photograph of the earth rising above the Lunar horizon); Around the World in 80 Days (the old fashioned hot-air balloon); Journey to the Center of the Earth (the mountain); The Hunt of the Meteor (the streaking comet); and a sailing ship represents Mr. Verne's many maritime epics. If you would like to read some of these stories, there are links to most of them. Retro Rocket Works made a line of beautiful fantasy themed wooden rocket kits a couple of years ago; unfortunately, they're no longer making them. The Jules Verne 29 has a mahogany veneer body tube, basswood fins and nosecone, and brass launch lugs. 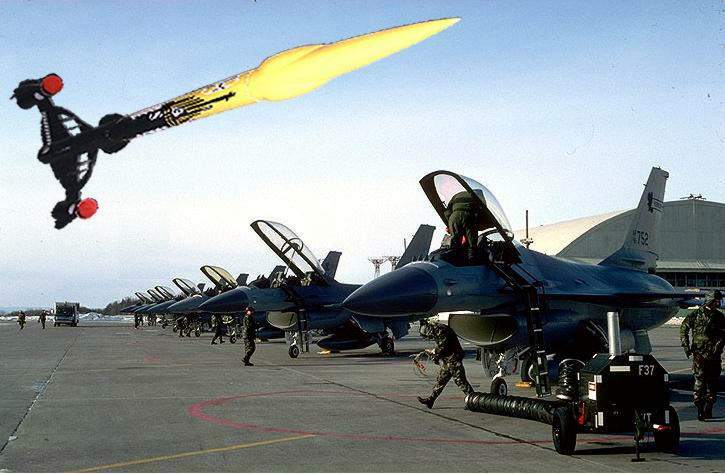 I've flown this rocket numerous times, including for my Level I certification, and it's always been a sturdy flyer. My favorite motor for it is the H-128. When it's not flying, it's sitting on display; I polish it with Lemon Pledge after every launch! 100% success rate on 5 launches, not counting a couple of igniter problems (easily corrected) and the one time the dog nearly got it. This is my 70's Vintage Estes Alien Invader. 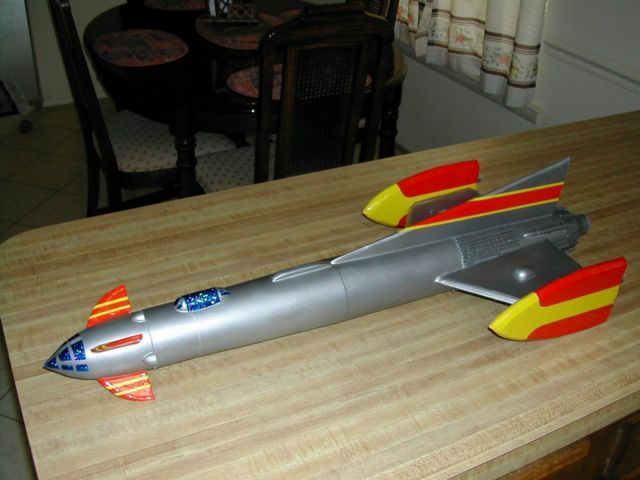 I built it back then near the end of my first age of rocketry and have never flown it. The complex peekaboo perforated fin structure is built entirely of balsa. 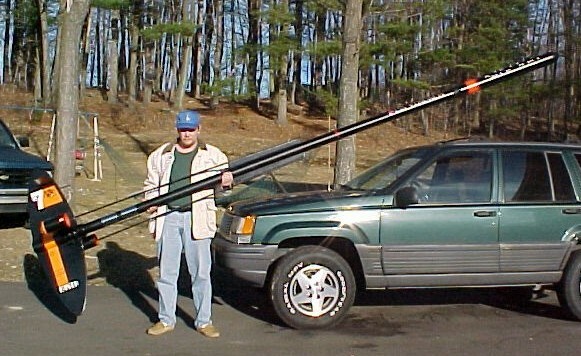 Two short tube sections attach as engine pods, with a hardwood dowel spike extending back from each pod. 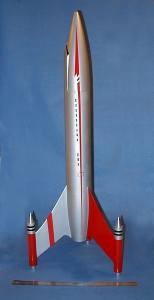 The nosecone is the only plastic component on the rocket. The complex black and white design was accomplished via a wet and slide decal. Will she ever fly? That's hard to say. She's awfully pretty, and a momento from a time gone by. I'd hate to see her fly and go bye. This kit is a scratch build of Pete Alway's Simple Vostok, 3D scanned. I manipulated the colors and the interstage part of the rocket to look a bit more like the real Vostok then created a 3-D scene with 3D Studio Max, and placed the 3D model of the rocket into the scene and rendered it. 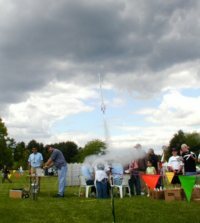 The Rocket has never flown as I have built it more of a show peice. Here's a Big Daddy in space. Not too impressive but it looks good. If I can't get a good flight, I'll make a picture of a good flight. 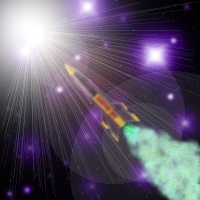 All except the rocket drawn in Paint Shop Pro 7. The two flights of my Big Daddy were successful but not very much altitude.